The dreaded unwrap is complete so the next task is to layer on some colour. 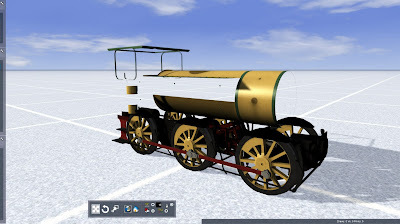 Before we started we gave the parts some simple colours in the 3D modelling programme to help visualise the parts that could be coloured together. 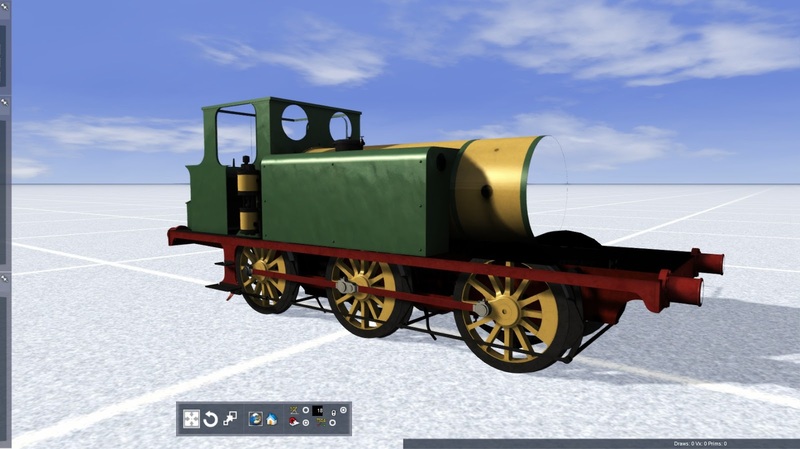 and the A1X in it's mostly unmodified layout. It's starting to look like something now. 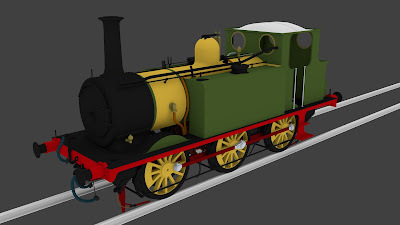 We should mention at this point that the green and "yellow" of the Improved Engine Green livery in these images are just place holders. We needed to do more research as to the correct original colours before we committed - as it turns out nobody is 100% sure of the colours but after reading a lot we're happy we've come up with one of the accepted variations which we'll show you when model is finished. Next came the Improved Engine Green lining - which is complicated to say the least! But after quite a few experiments we came up with a set of parts to build the lining textures and it started to come together. Again, the green and yellow are temporary colours - this was all about getting the lining detail correct. Once we were happy with the side panel it was time to complete the rest of the lining which covers most of the flat panels on the engine as well as the rear of the bunker and the A1's rear mounted toolbox. And just as this is all getting exciting.. it's time to break for Christmas! We'll try and make a post next week with the progress that has happened since these pictures, or at the very least our traditional Christmas screenshot and best wishes. 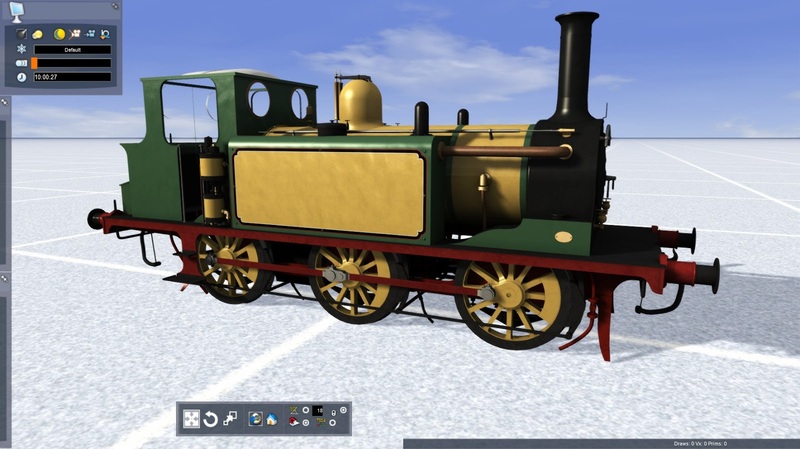 We've not decided on all liveries yet - initially we want to do those that most of the A1 and A1X's shared or were common. On saying that we'd like to do as many liveries as possible as there are so many types. 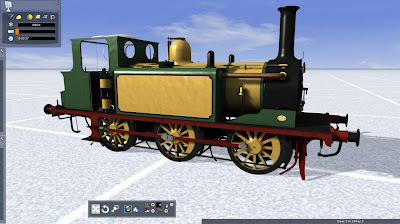 We're starting to think we might need 1 or 2 add-on packs to cover ever livery we'd like to do. This is getting along very nicely. Tell me, if you don't mind me asking; what names will be used when the terriers are finished? We'll provide all 50 names/numbers as standard when you drop a new loco into the game, however you can type any name (from 1 to 11 characters) into the loco scenario number that you want to and it will display with the correct spacing. Ok good to know. 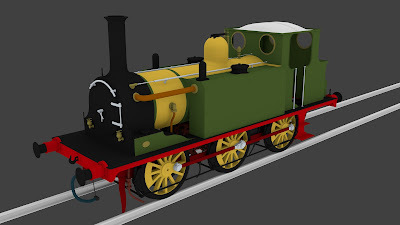 Me and a friend of mine are anxious to see these new engines, and we feared that one of his favorites, "Freshwater," wouldn't be in the pack. Nicely done with the Terrier. Don't forget wheels were partly green as well. Indeed the wheel centres were green as well as the weights but with spokes "painted on" in yellow. 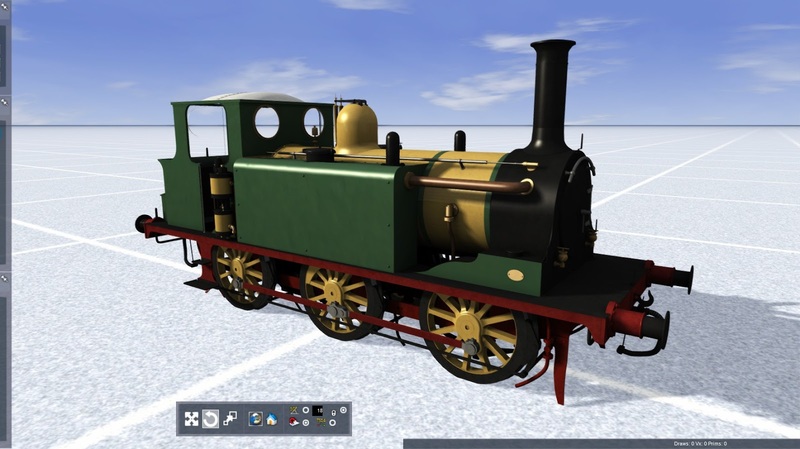 Just curious, but will you include the GWR terrier (she was only there for a short while) in this pack and how many liveries do u estimate will be in this. Oh and SSS OR Steam?? ?